Excellent - that works fine. Shame its so difficult to find. Hum, still requires going into each class one at a time. 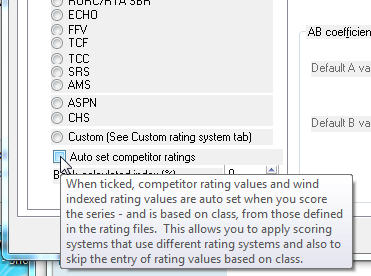 The alternative is that you go into "Edit Competitor", and re-select the class to what it already is (picking up a change in the process), If the Edit Next tickbox is set then this makes it easier to work down the whole fleet. My other solution was to write some Java which would read the blw file and re-write it ! Hope this helps. If anyone finds a better fix then post here! I have the same question... I have a all the club racers in a sailwave file which I use to populate future series, but I can't find a way to update the PY numbers using the new 2014 ratings file. Have you found a solution anywhere else? What do you have to do to get sailwave to update all the sailors Ratings when a new Ratings file is presented? I have got the global options pointing at the new Ratings file because if I click on any one helm and select their existing Class then the rating is updated. But I really don't want to go through every helm one by one and do this. There was a menu option that appeared a couple of years back; Tools / Update Ratings - but this has been removed in the more recent versions! Help.